Description: Red-necked Phalaropes are the size of a large sparrow. Breeding females are dark slategray above and along the sides of the breast, with a broad buff mantle, mostly black head, white throat and a white spot above their eye. Males are duller. The nonbreeding plumage is gray above appearing striped with white due to the pattern of their scapulars and tertials. They have a prominent, dark postocular stripe and dark ear patch. In flight, they show a white wing stripe. Similar Species: Red-necked Phalaropes are the smallest of the phalaropes, are darker and have a prominent eye spot during the nonbreeding season. Red Phalaropes are chunkier in appearance and have shorter, thicker bills. 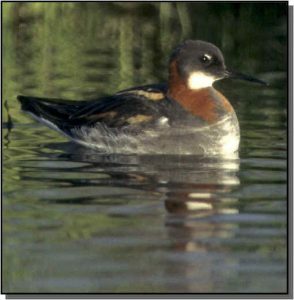 Comments: Red-necked Phalaropes nest on the arctic tundra and muskeg ponds and spend winters on the open ocean, in coastal bays and freshwater lakes. They are seen on wetlands within the Great Plains during migration.